This horn center cap features the correct gold ring as found on the "over-the-counter" 1966 Shelby genuine wood steering wheels. It also features a foil emblem that is very close to the original. NOTE: We now have our part number IN-7397 with the stamped aluminum GT350 emblem also. 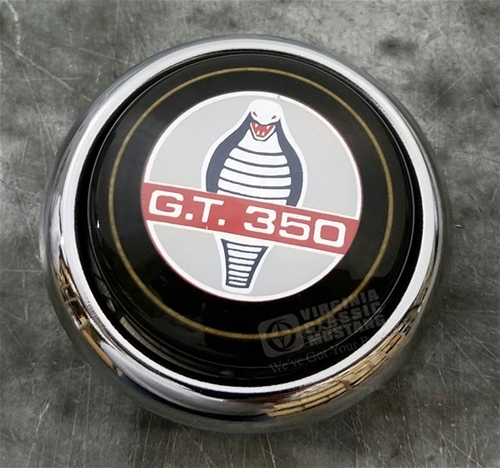 There is no historical paperwork showing that these steering wheel came on any 66 GT350s directly from Shelby American, but they were available as an accessory from the Shelby parts catalog. These wheels are much, much nicer than the simulated wood (plastic) steering wheels originally installed. This cap fits our genuine wood IN-6791 steering wheel and can be installed on any year. The cap will also work with original genuine wood Shelby steering wheels. With this steering wheel and cap installed on the car, you will have a look that is virtually identical to the original Shelby American wheel. It's super popular with 66 Shelby owners who love to drive their cars.